Tata Motors and Gulf Oil Lubricants India Limited (GOLIL), officially signed an agreement to launch a range of co-branded lubricants for its passenger vehicle segment in India. 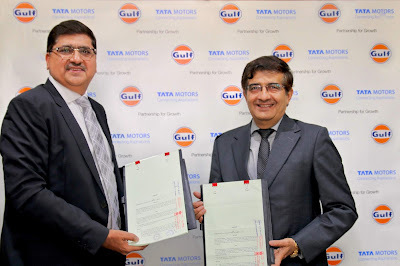 Signed in the presence of Mayank Pareek, President – PVBU, Tata Motors, S.N. Barman - Vice President, Sales, Marketing & Customer Support, PVBU, Tata Motors,Subhajit Roy - Head – Customer Care, PVBU, Ravi Chawla, MD, Gulf Oil Lubricants India Limited and Shiva Raj Mehra, Head, Automotive OEM business, GOLIL, the Companies will be selling co-branded Tata Motors Genuine Oil in the high street bazaar market under this partnership.